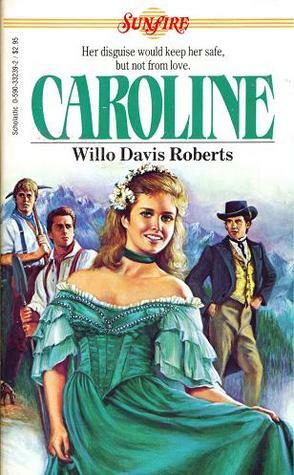 Caroline by Willo Davis Roberts. Scholastic, 1984. No longer in print. Face Value: It’s terrible of course, but it evokes a certain nostalgia for me. All the Sunfire covers looked like this, basically – a girl in historical garb looking off into the distance with the men vying for her attention looking surly in the background. Nevermind that Caroline spends the majority of this book disguised as a boy, and that she actually only has one love interest on the horizon (unusual for a Sunfire romance, if I remember correctly). But it’s the tagline that really sells the story – “Her disguise would keep her safe. But not from love.” How can you not be a strange mix of excited and horrified for that? Does it Break the Slate? It kind of does! Sure, it’s a kind of surface value feminism – Caroline is just as competent as a boy! She’s strong! She can swim! She can shoot! But once her secret is revealed, everyone agrees – she was always just “too pretty to be a boy.” But it is kind of great, the way that Caroline acknowledges liking both the freedom and respect she gets for her skills when disguised as a boy and the more traditional feminine experiences, like wearing pretty dresses and dancing in them. When her secret is revealed, Caroline gets to live the best of both worlds because Dan Riddle loves her just the way she is. It’s surprisingly satisfying, from a feminist POV, even if it’s all resolved far too easily. Who would we give it to? Hmm, that’s a good question. This romance looks and feels pretty dated, and I’m not sure that it would hold up for a contemporary YA reader without the nostalgia factor. The writing is appealing, but also totally cheesy. And even a frontier book written in the 1980s (more than 50 years after Laura and Caddie) has painfully racist elements. So I probably won’t be recommending it to anyone who isn’t seeking out a nostalgic look back at the Sunfire series. I think that the most distinctly Slatebreaking element of this book is how legitimately Caroline is allowed to like both being a boy and being a girl. She disguises herself as a boy out of necessity, but finds that she appreciates the freedom she gets in boys’ clothing and the way she actually gets to use her skills. But she also still finds value in being a girl. I like that, that this character isn’t ashamed to want access to both worlds. Once her secret is revealed and she and Dan are engaged, she is overjoyed about dressing up like a woman again, but still has every intention of being Dan’s partner in the work of the frontier. “She felt dainty and feminine and lovely, and when Dan turned toward her, she knew that he saw her the same way. Also, Caroline and her companions might have had the easiest trip down the Oregon Trail in all of literature. Seriously. Only one death, and it’s a minor character. Who was already old. No disease and hardly any bad weather, no one is accidentally poisoned to death by hemlock or pitted against the elements because a late arrival lead to getting stuck in a snowstorm or running out of badly needed supplies. They easily find themselves in California by August, where Caroline immediately strikes gold and then finds her brothers, all building up to a practically Austen-esque triple wedding. The simplicity of the journey and the ease with which Dan, the Roericks and everyone else accept that Caro was a girl all along do a disservice to the challenges and gender stereotypes that Caroline would actually have to face – and thus keep us from an actual dialogue about gender roles. And, unfortunately, as we have seen with so much of the frontier fiction we loved as children, the depiction of Native Americans in this story is uncomfortably racist, and, like in Caddie Woodlawn, plays heavily on the notion of the white savior. Native Americans feature only briefly in this story, but when they do, these characters have names like “Old One Who Speaks Truth” and offer sage wisdom and useful gifts to our white protagonists for saving their lives. Add that to the fact that Caro and Dan name their horses Chief and Papoose because they think it’s funny. And this book wasn’t written all that long ago either. Yeah, it’s old, and we’ve gotten more culturally progressive since 1984. But it wasn’t written in 1890 and it wasn’t written by people who actually lived it. So we cannot talk about the racism in this book as a product of its time. It is unacceptable, and it devalues the things that are good, and enjoyable in this book. Reviewed from a copy I owned as a child and salvaged from my parents’ house a few years ago. This entry was posted in Reviews, Theme Week, Young Adult and tagged California, disguise, Frontier Week, Gender, Historical Fiction, Oregon Trail, pioneers, Romance, Sunfire. Bookmark the permalink.